If you’re looking for remote — and if you’re visiting Lapland, chances are you like remote places — it doesn’t get much moreso than Utsjoki. Finland’s northernmost municipality is also once of its most sparsely populated; most sources list the number of people living there as .25 people/km2. That’s not many people at all. Traditional fishing boats lining the River Teno in Utsjoki. Unfortunately for the region, the fact that it is so remote does make it less visited than other areas in Finnish Lapland. The typical tourist trail tends to lead from Karasjok in Norway across to Inari, cutting out Utsjoki completely. I can say this from experience, since that’s the exact route I took during my winter trip to Finnish Lapland. However, just because that’s the typical route doesn’t make it the correct one. 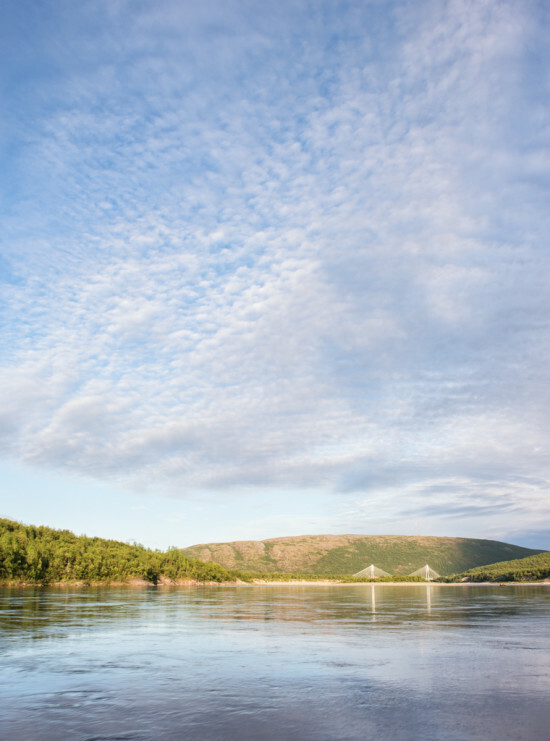 In any season, Utsjoki offers a great combination of unique experiences that you won’t find elsewhere as well as many of those activities found across Lapland, such as snowmobiling, dogsledding, and northern lights watching (in winter) and hiking and mountain biking (in summer). Plus, it’s easy to access from both Inari and Karasjok (a 1.5 hour drive on the E75 or the E6, respectively). 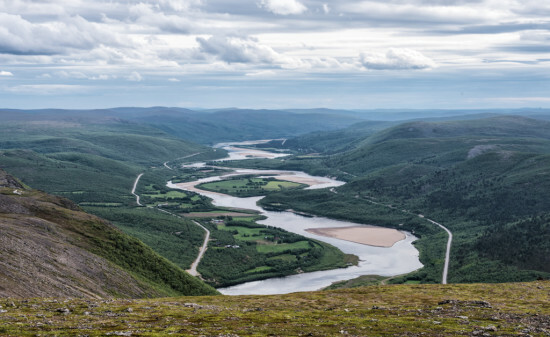 Gorgeous views of the River Teno from the top of Nuvvus Ailigas in Utsjoki municipality. Even though I didn’t give Utsjoki nearly enough time on my summer trip — a rejig of my itinerary cut my time there down to just over a day — the time I did spend in the northernmost reaches of Finland was absolutely packed. I could have easily spent the rest of the week there and still had plenty to do — and maybe a bit of time to relax next to the mighty River Teno as well! So if you were to head to Finland’s far north in summer, what would I recommend you do? Salmon fishing around 10pm in early July on the Tenojoki. 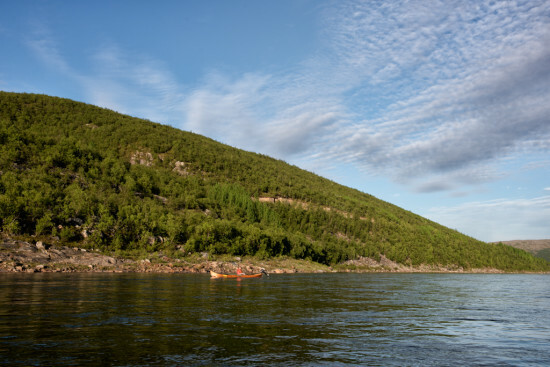 One of the most defining features of Utsjoki’s landscape is the River Teno. Also known as the Tenojoki in Finnish or the Tana in Norwegian, this large river runs along more than 250km of the Finnish-Norwegian border. And, importantly to fishermen, this river is well known as being the best salmon fishing river in northern Europe. Even if you’re not an avid fisherman, you really should try salmon fishing on the Teno at least once. It’s an experience unlike any other fishing trip you’ve ever taken — that is unless you’ve been fishing for salmon in other areas of Norway or Finland (such as the River Muonio to the west). One of many fisherman going up and down the Tenojoki in hopes of catching some salmon. Fishing on the Teno is done from traditional wooden fishing boats, which you can either hire for your own personal use or with a guide to show you the ropes. If you’re like me, with virtually no experience fishing and even less so with traditional wooden boats, it will be a no-brainer to go out with a guide! This is no passive activity either. Salmon fishing in the Teno requires someone to be rowing the boat constantly against the current, which in this river is no slouch. How do you hold a fishing rod and row if you’re the only person in the boat? The short answer is that you don’t. Instead, each boat has been equipped with five mounts, each of which locks a rod into place. You’ll only need to grab one if you hook a fish, and since you’ve got five of them, your chances should be five times better, right? 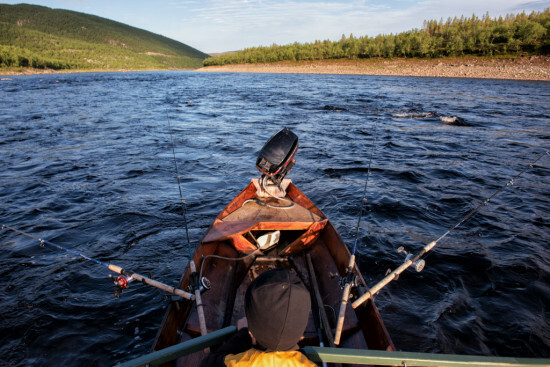 There’s a lot of effort involved when fishing on the River Teno. The other really unique thing that fishing in this part of the world offers is the ability to fish all night long. 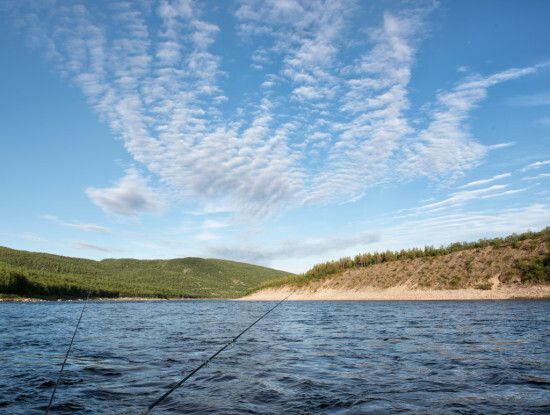 Because the sun rises in Utsjoki in mid-May in and doesn’t drop to the horizon again until mid-July, it’s common for fishermen to be out on the river at 2am. And, since permits do not allow those without a local rower in their boat to fish between 2pm-9pm, it’s a lot more likely that people will be out well into the night. That said, schedules become much more fluid under the midnight sun, so this really isn’t a problem! 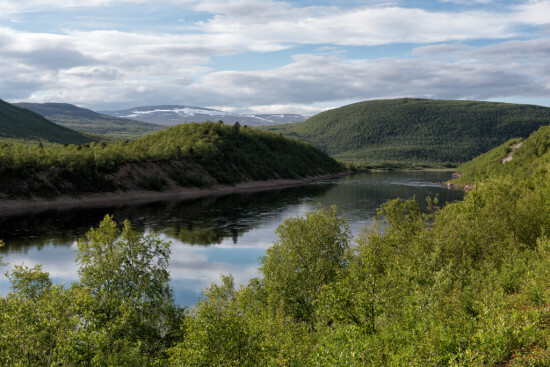 Utsjoki is surrounded by fells — and even a few mountains on the Norwegian side — so it has no end of hiking opportunities available. Three of those opportunities are up three separate fells called Ailigas. Despite having the same name are actually not very close to each other; that’s because their names are not to do with geography, but rather mean “holy fell” in the Northern Sami language. The Ailigas near Utsjoki village visible behind the Sami Bridge. The Ailigas fell closest to Utsjoki towers over the village itself. It can be easily seen throughout the area, both for its height and the TV towers that stand near the top. At only 320m, it is quite an easy climb and has spectacular views across the village and into Norway. 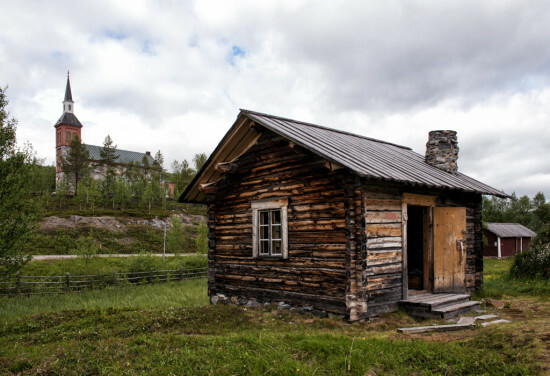 The furthest Ailigas from the village of Utsjoki is just outside the village of Karigasniemi, which sits across the border from the larger town of Karasjok on the Norwegian side. 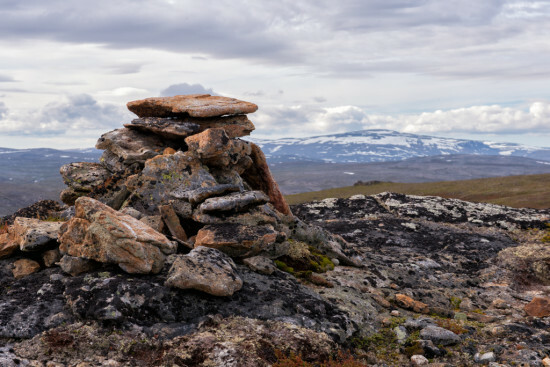 This Ailigas is by far the tallest (at 620m tall) and, in keeping with its name, is considered to be a Sami sacred site. The River Teno forming figure eights as it flows towards Utsjoki from Karigasniemi. 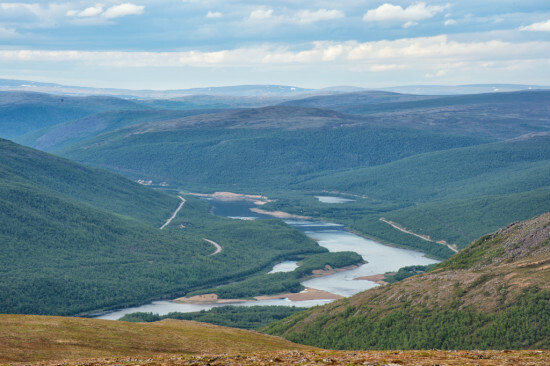 The middle Ailigas is located near Nuvvus, which is roughly 50km away from Utsjoki on the road to Karigasniemi. At 535m, it is still much taller than the Ailigas in Utsjoki, but it is still quite an easy climb. You can drive partway up the mountain until you reach a gated road; from there, it is around 45min – 1 hour to the top. As you walk, you’ll quickly climb past the treeline and across a grassy landscape as the views stretch out behind you. Since the walk is up the southern side of the mountain, the big reveal is saved for the top when you are rewarded with panoramic views of the Tenojoki and the mountains of Norway (particularly the peak of Rásttigáisá) on the other side. The river itself is dotted with grassy islands — some Norwegian, some Finnish — so the river seems to create a series of figure eights as it winds into the distance. Looking towards the mountain of Rásttigáisá in Norway from the top of Nuvvus Ailigas. The three Ailigas fells provide just a few of many hiking trails in the region. In particular, Kevo Nature Reserve is another very popular place to hike, especially if you want to hike for multiple days. To find out more, head to the Finnish National Parks website. The E6 (also called Tenontie) between Karigasniemi and Utsjoki is renowned as being “the most beautiful road in Finland.” Why is that? Well, many of the roads in Lapland are stunning. When driving, you’ll often find yourself in the middle of what seems like never-ending forest or between lines of blue-green fells stretching as far as you can see into the distance. Occasionally, they snake alongside rivers and weave along the shoreline of lakes. One of many great views along the “most beautiful road in Finland.” This one is about 40km from Utsjoki. The E6 has nearly all of this in one 100km stretch. It winds its way along the River Teno at ground level before working its way uphill to give you a wider view of the river and the fells surrounding it. In summer’, the trees lining the river and climbing up the fells are a brilliant yellow-green. On the Norwegian side, mountains rise up beyond the tree-lined fells. Bare of vegetation, their rocky, grey outlines are dotted with white patches of snow clinging on for dear life. Can it be said with 100% certainty that this is the most stunning road in Finland? No, but it certainly gives every other road a very high bar to compete against. And, given you could drive half of the road — turning around at Nuvvus and making plenty of stops for photos along the way — and still beback in Utsjoki within 2 hours, there really is no reason not to do it! One of the church huts with the parish church in the background. 6km south of Utsjoki, you’ll find the town’s old stone church, which was finished in 1853. This church stands in a commanding position over the calm shores of Lake Mantojärvi, but what it makes it truly different from other churches you may have seen around Lapland is the church huts that line the lakeshore below. While not very common across Finnish Lapland, these wooden huts resemble the church villages of towns in Swedish Lapland such as Skellefteå and Luleå but on a much smaller scale. Only 14 of the huts now remain (or have been reconstructed). The oldest is from the 18th century. The turf hut with Lake Mantojärvi in the background. Both the Swedish and Finnish church villages were built to house those that lived far from town but came in for church on the weekends. 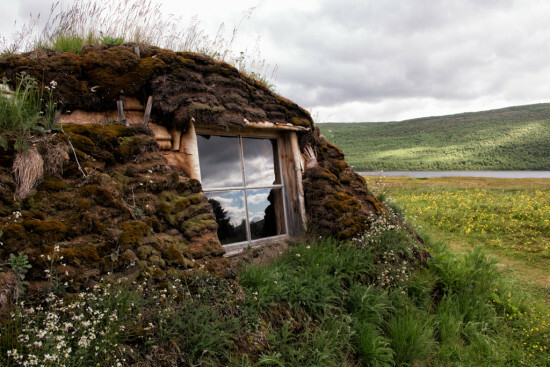 However, the church village in Utsjoki specifically catered for the Sami — families that were otherwise nomadic. This makes a lot of sense, since Utsjoki is actually the only municipality in Finland where the majority of people are of Sami descent. The huts themselves are all quite different. 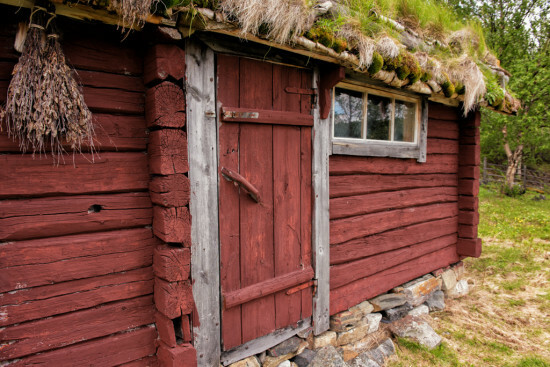 Some are completely fashioned out of wood, while others have turf roofs (complete with tiny yellow flowers), and one hut is even made completely out of turf, with such low interiors that you have to really double over to get inside. And to think, a tiny hut like this could have housed a family with eight children! The sauna. The vihta is visible hanging from the roof on the left hand side. Other buildings have survived as well — on top of the hill stands a now-silent stable. Closer to the lake stands a traditional wooden sauna, which even has an old vihta (a small bunch of birch twigs used for hitting yourself in the sauna. It sounds odd, but it’s said to be revitalising for your skin). It’s possible to enter the church village and explore whenever you like, but if you’d like to see the inside of many of the huts, you’ll need to ask for a guided tour from the on-site café. These tours are free but are offered only in the summer months. The holiday village centre at Nuorgam. About 40km to the northeast of Utsjoki is the small village of Nuorgam. 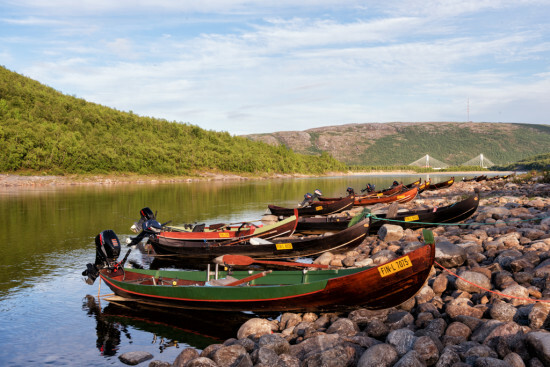 Like Utsjoki, Nuorgam is also situated on the Teno River and is home to a lovely little holiday village on the riverbank; if you wanted, you could easily base your salmon fishing expeditions here as well. Many visitors from all around Europe head here to do exactly that. 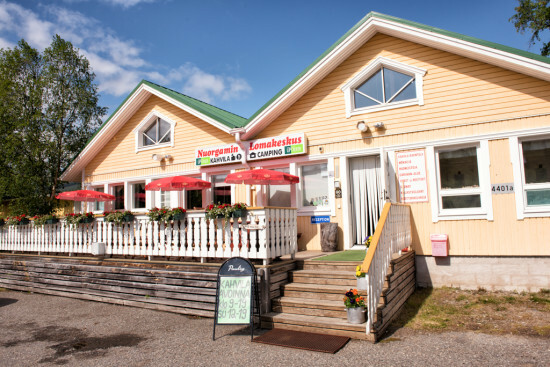 The village itself has a very international feel due to the large number of Norwegian visitors; after all, Norway is only a few kilometres away and accommodation, food, and petrol are all cheaper on the Finnish side of the border. One of the other reasons that visitors to Lapland venture to this remote hamlet is to see the northernmost village in the European Union. While it is located 500km north of the Arctic Circle and very close to the northernmost point in Finland, it may seem odd that this village is designated “northernmost” when it features a border crossing — heading north — into Norway. However, it makes more sense when you remember that Norway isn’t actually part of the European Union! 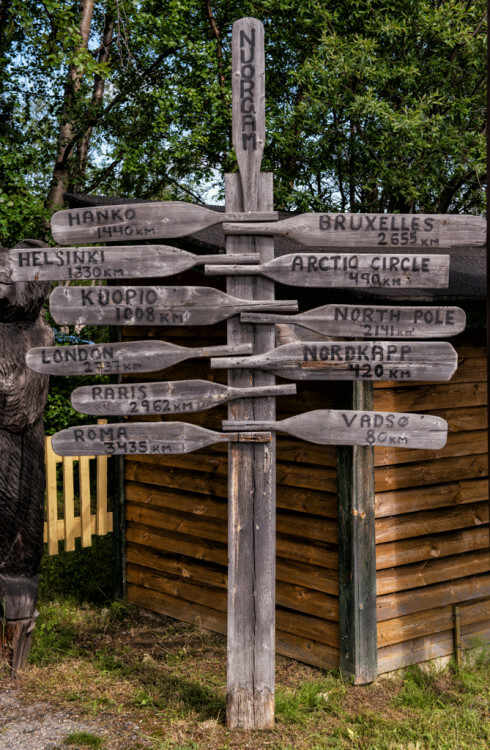 A directions sign made of paddles in Nuorgam. If you’re looking for somewhere bustling — or somewhere with big, ostentatious landmarks, since Nuorgam’s few signs to mark its “northernmost” status can be missed in a blink — Nuorgam won’t be for you. But, if you’re looking for a quiet spot where you can relax and maybe catch a few dinner’s worth of food, you’ll enjoy it here. As you can see, for a place that has so few people, Utsjoki still has plenty of unique opportunities to get out and enjoy the Finnish wilderness, and I’m sure if I’d had more than just a rushed visit, I would have discovered even more. It’s definitely worth a detour off the beaten tourist path…and really, how could you resist when that detour is said to be the most beautiful road in Finland? I visited Utsjoki courtesy of Utsjoki Municipality and Tundra Safari, but as always, all opinions stated here are my own. Utsjoki can be reached via 1.5hr drives along either the E6 (from Karasjok) or the E75 (from Inari). To fish in the Tenojoki, you must have a salmon fishing license, which is either for €25/day for fishing from the riverbank or €40 for fishing in a boat. These licenses can be purchased from local shops and holiday villages. It’s worth noting that, unless you hire a local rower, you cannot be on the river between 2pm-9pm and the river is closed to all fishermen from 7pm Sunday-7pm Monday each week.